 "On to Kazakhstan," Nukem, October 1995, p. 18. "Canadian Companies to Finance Uranium Venture," Nuclear News, October 1995, p. 48. "Cameco Completes Uranerz Acquisition," Business Wire, 11 August 1998; Lexis-Nexis Academic Universe, www.web.lexis-nexis.com. 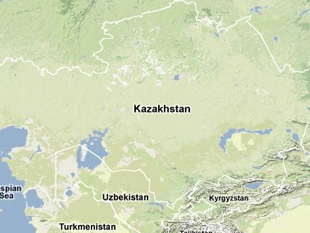 "Cameco/Kazatomprom to Assess Potential of Kazakhstan Uranium Project," Cameco, 21 July 2000, www.cameco.com. "Interview: The President Speaks," Nukem, May 1994, pp. 14-15. "Joint Uranium Processing Projects in Kazakhstan Worth over $600 million," Interfax CIS Daily News Brief, Volume II, Issue 100 (122), 1 June 2000. “Cameco 2013 Annual Report – Mineral Reserves,” Cameco, 31 December 2013, www.cameco.com.